Fans of Robert E McGinnis' art will be delighted with this book. And those who don't know who he is will be surprised by his stunning work. Born in 1926, McGinnis started his career early in 1947. However he didn't start painting paperback covers until 1958. But after he started, he has painted over a thousand of them, on top of other illustrations he has created for movies and magazines. He is one of the great illustrations who is as inspiring as Norman Rockwell, Andrew Wyeth, Coby Whitmore, Drew Struzan. This 176-page hardcover features over six decades worth of splendid work. The paper quality used is low gloss and reproduction quality is fantastic. Bravo to publisher Titan Books. Actually, there was another McGinnis artbook published in 2000 titled Tapestry: The Paintings of Robert E. McGinnis. 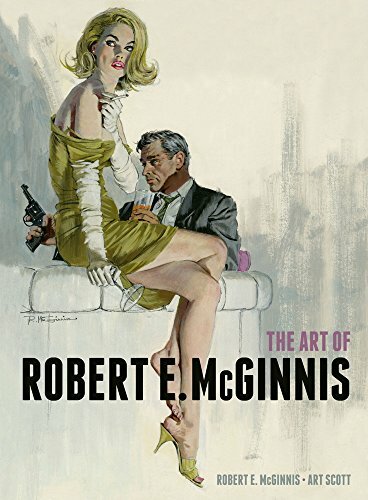 There are some duplication of artworks but this book is still worth getting because it has included works from 2000 to 2014, Yes, McGinnis is still painting today. The book starts of with a lengthy interview by author Art Scott with the artist and is followed by the galleries of artworks. You'll get to see the cover art that has adorned paperback titles of the past, iconic movie posters such as for Breakfast at Tiffany's and James Bond, works for various magazines, his personal paintings of nudes, Western and contemporary landscapes. Among which you'll see the many stunning 'McGinnis women'. His style, sense of aesthetics and colours are amazing. One cover was deemed to saucy and had a sticker pasted strategically over the offending bit. The accompanying text has McGinnis sharing his creative process, insights from his career and some stories behind the selected pieces of works. He talks about elaborate wraparound art that require meticulous research and extensive model shoots, movie posters that require countless iterations, paintings for men's magazines where he did not want to be associated with, and other interesting stuff. Not only that, I also enjoyed reading the descriptions of those paperbacks, such as one that has "Man, she had a shape to make corpses kick open caskets - and she was dead set on giving me rigor mortis." Most of the time, the artworks are reproduced in their raw form without the other forms of typography or designs. Even when actual book covers are used, the art is not obscured because McGinnis had taken into account the space for the book titles and other text elements. This wonderful artbook will make a fine addition to the shelves of any art lovers. One of my favourites for 2014.